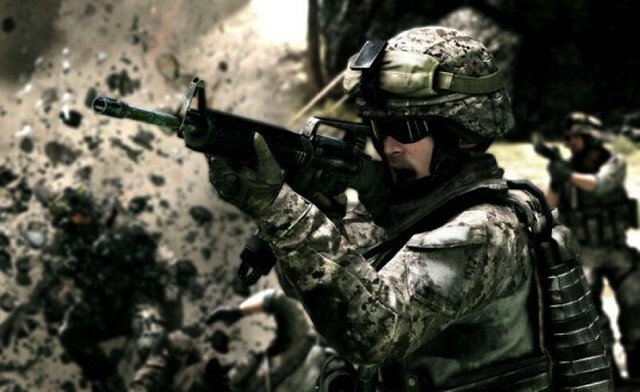 Starting now, we are happy to invite all PS3 players to the much anticipated Battlefield 3 Open Beta! Played on the Operation Metro map in Rush mode that won us Best Action Game and Best Multiplayer Game at E3, this is your chance to experience one of many flavors of Battlefield 3. We would like to take this opportunity to thank all of you for your great interest in this Open Beta. By joining, you will help us stress test servers, allow us to run important tests on the game’s back-end and Battlelog. Remember that this software is in Beta and does not represent the game’s final quality — you’ll have to wait for October 25th for that! For a full FAQ on the Open Beta, head here. Please leave any feedback to us at DICE via the forums in the social platform Battlelog. Make sure to also head to our free social platform Battlelog to check your in-depth stats progression, start your own Platoon, and see how your friends are doing in the news feed. To get you started on the Operation Metro map, here are some playing tips straight from us at DICE. 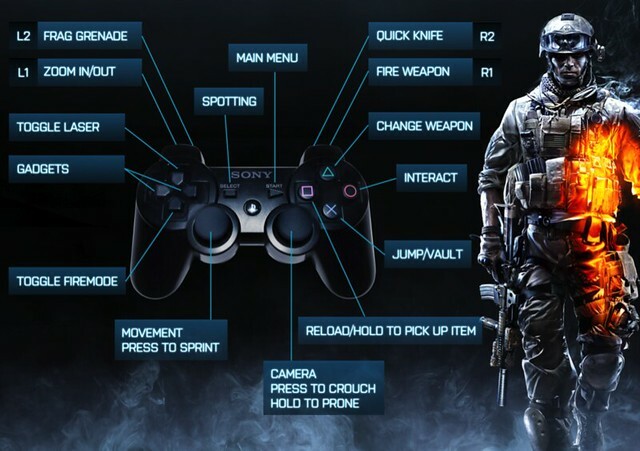 You can also study the PS3 control scheme in the image below. Enjoy, and let us know what you think! Stick to your teammates, and remember to spawn on them to stay close to the fight. Use your kit specific abilities to help your team mates. Assault can hand out med kits, Engineers can repair vehicles, and Support can hand out ammo. When you arm an M-COM station, defend it to ensure it’s destroyed. The bombed-out tunnel section in Operation Metro is an excellent place to use a flashlight as one of your weapon attachments. Use it to light the tunnels up – and to blind your enemies! Attach bipods to your weapon and deploy it automatically by pushing up against cover or laying prone and zooming in – this gives you a huge increase in accuracy and stability. Use suppressive fire (shoot close to enemies behind cover) to negatively impact the enemy’s fighting capabilities. Watch out for falling debris — it can hurt you! But you can also hurt your enemies by taking out buildings with the Engineer’s RPG. Shotguns are excellent for CQC (Close Quarters Combat) in the tighter tunnels sections. Fire automatic weapons in short bursts for accuracy, or switch to single-fire mode if applicable. To grab your enemy’s dog tag as a souvenir, perform a stealth knife kill from behind. this is the best day ever!!!!!!!!!!!! thank you ea and dice!!!!!!!!!!! thank you playstation blog to bring this info to me!!!!!!!!!!! and thanks to sony for the best console ever!!!!! lol at FIRST! :D lets go BF3!!!!!! I’ve been playing this for two days now and I love it. Why did you all strip down this map so drastically? The alpha videos I’ve seen had vehicles and everything. Can’t wait for the full release because this is very fun but there’s not much to it. It’s underwhelming. Already got it! Amazing! Waka waka! The US store updated too slow, I download it off from the UK store. F-Yeah! Finally more people can come in and play! Been playing the Beta, love it so far. Hope another map is added soon. Too all Battlefield Noobs: Please Learn how to SPOT!! Spotting involves simply pressing the “Select” button when your cross-hairs are pointed on an enemy. Spotting will show your enemies’ location to teammates and when used on a regular basis by enough squad members, it is a powerful tool. I’ve been downloading it for half an hour now. Can’t wait to finally meet up with my MoH early access clan tonite and record for YouTube! OK well that one worked. I have been playing for two days now and have a question… DICE, why did you all strip this map down so much? Where are the vehicles? It’s great looking and plays like a dream but the environment is underwhelming without the extras that we love aboujt BF series ie APVs, tanks, etc Casn’t wait for Oct 26th!!! Let’s Move out!!!! GO GO GO GO!!!! why do you keep losing my posts, Sony??? Been waiting for this! Played Alpha but meh didn’t like it on PC. Since Assault is going to be the guy at the frontline, getting hurt all the time, it figures that he should be the one patching up his squad mates at the front. While ammo and LMG makes a perfect fit for the Support. Try laying down some suppressive fire with a Support from afar. Suppressing gives the enemy a slight blur effect and lowers his accuracy — and gives you teamplay score. @24, I’m sure they’d say it’s a balancing thing, but I couldn’t tell you how. Doesn’t make sense to me, either. thats sooo coool :D !!!!! Finally, been waiting all day for this. Btw, i want to use Battlelog, how do you get it to work with your Ps3? or does the beta version only work for PC users? anyone knows? would be awesome to know how if you can tell me. it makes perfect sense for the support to throw ammo hes the guy with the big gun that is shooting nonstop it is his job. There has always been a deficiency of medics in battle field and since there are a lot of people who play assault this fixes the problem of there being no medics. I am still at work cant wait to get home and download this. L.A. How are the graphics? MY QUESTION IS….WILL THE SERVERS FOR THIS GAME WILL WORK PROPERLY CUZ WITH UNCHARTED 3 ON PSN WAS TOTALLY SLOW! BUT I WILL LOOK UP FOR THIS ONE! Hi is this available in the Canadian store as well? I couldn’t wait all day for you guys to put it up so I got it from the UK store at like 8am . Awesome fun though and can’t wait for the 29th of October. now i downloading the game, I’m excited. @37 – That’s why they are having an open beta; to test the servers and make sure they work properly. I keep getting a 80700192 code when i try to sign in! anyone else getting this? I want to play this Beta so bad! YAY!! My Daughter just text me to let me know that the beta has been downloaded and waiting for me to get home from work. Thank You Sony & Dice…it’s great to check new stuff out before a release!